In case you hadn't noticed I have been on a bit of a self-imposed sabbatical. No real excuse but to say I felt funky and decided a rest might do me well, and, it has! I am feeling much improved over April and May and ready to show my face again. So, if your still checking in to see if I had anything to share with you and your still interested, then I have a tiny treat for you today. 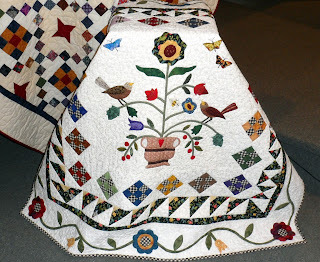 My friend Liz accepted my invitation to attend a local guilds Quilt Festival in a quaint and beautiful small church about a half hours drive from where I live this afternoon. When Liz arrived she brought along her new furry four legged companion "Kiki" who is but a year old, a rescued pup. My goodness but she is so sweet and took to me right away and I had the greatest amount of cuddles all afternoon, admittedly I missed these types of teeny wet kisses and adoring looks. The guild members from what I could gather are all 70+ and older, so these quilts are very special. I digress, on to the Quilts! This was so so well done, hand pieced and hand quilted. Because of the lack of space in this small church, each quilt was folded over on the pews and then displayed rather nicely in front of and upon the alter area. I would love to have seen this colorful Bargello fully displayed. This Log Cabin was also very interesting as each part was different shapes, only this one flower was visible. This beauty was hand pieced, appliqued and hand quilted and my camera somehow does not do it justice. Now this too was all hand appliqued and hand quilted, a striking display of fruits. Liz really liked this one with a huge variety of blues and hand embroidery around the printed patterned medallions. I was partial to this interesting red and white. All pieced, embroidered and quilted by machine. This is the final quilt of the day to share with you, pieced by machine with all hand applique and quilting. I am so very happy to be back to blogging again and ask your forgiveness for staying away so long...I hope you'll come visit with me again.